From a distance, the twisted, green sculpture set along the Hillsborough River in Tampa, Florida, looks like an inappropriately planted tree. It sits on a pier that juts out over the river, calling attention to itself. 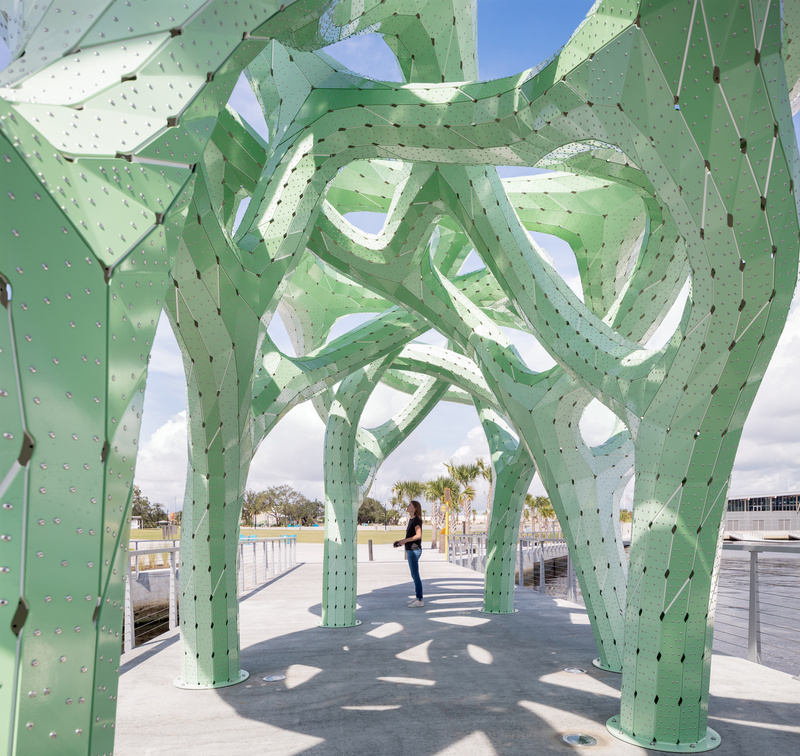 But the massive permanent installation, designed by Marc Fornes of the New York-based computational and digital fabrication studio THEVERYMANY, is actually a winding collection of aluminum plates assembled to resemble the native mangroves that take root along Florida’s shorelines. 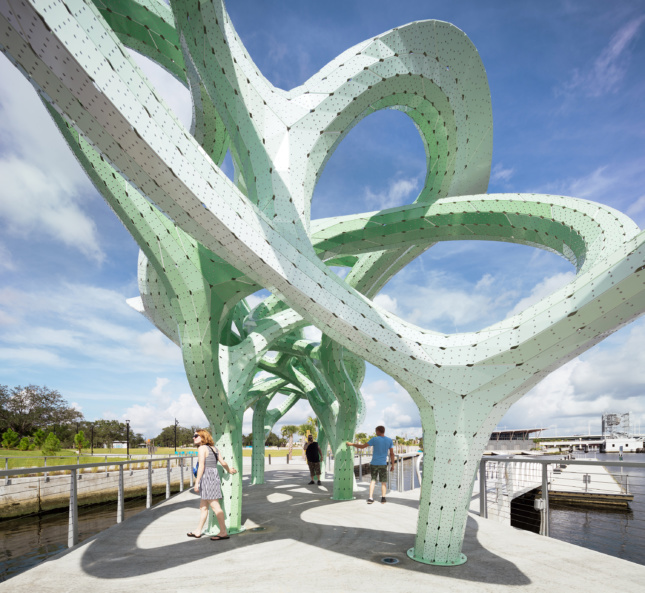 Form of Wander, as the structure is called, features seven trunk-like columns that stretch the entire pier and connect via a mess of branches. 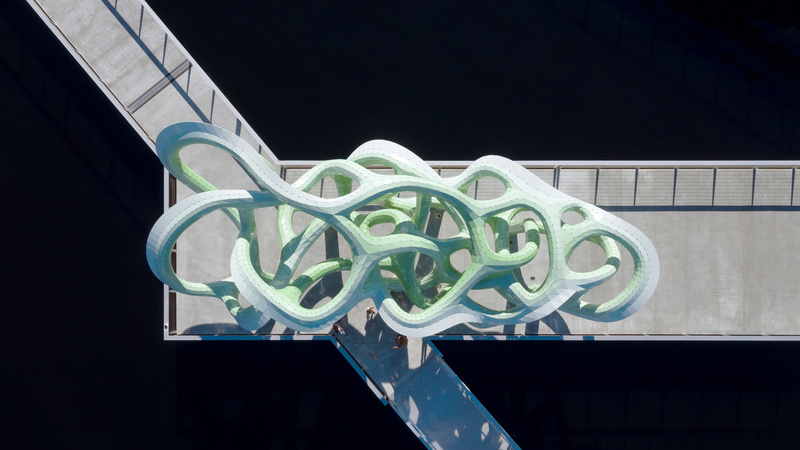 Standing 21-feet-tall, the green-tinted structure is made up of thin, aluminum metal plates with a double layer core. Overall, it has 3,123 parts. The exterior layers, which include six different gradients of green, reflect light and take on a brighter color in the sun. According to Fornes, the tangled network of branches and its cantilevered edges were designed to look as if the form had been swept up by the wind. The site-specific project was created to complement the landscape of the Julian B. Lane Riverfront Park near downtown Tampa. The 25-acre park opened last May and includes an array of amenities for sports, leisure activities, art-viewing, and more. One of its greatest natural resources, however, is the collection of beautiful mangrove trees that line the parkland. These mangroves, which evolved over time into dense thickets to prevent storm surge, are part of the land’s resilient ecology. Much like the real thing, Form of Wander can withstand severe weather, too. It held up when Hurricane Michael ripped through Florida’s Gulf Coast earlier last month. While the striking sculpture has both striking visual and resilient qualities, its purpose is simple. Fornes designed Form of Wander to enhance a leisurely walk in the park. Based on the tradition of 17th-century French gardening, the project creates an allée, or promenade on the pier, lined with manicured trees (or in this case metal structures) that frames views of the sky and leads to a point on the horizon. 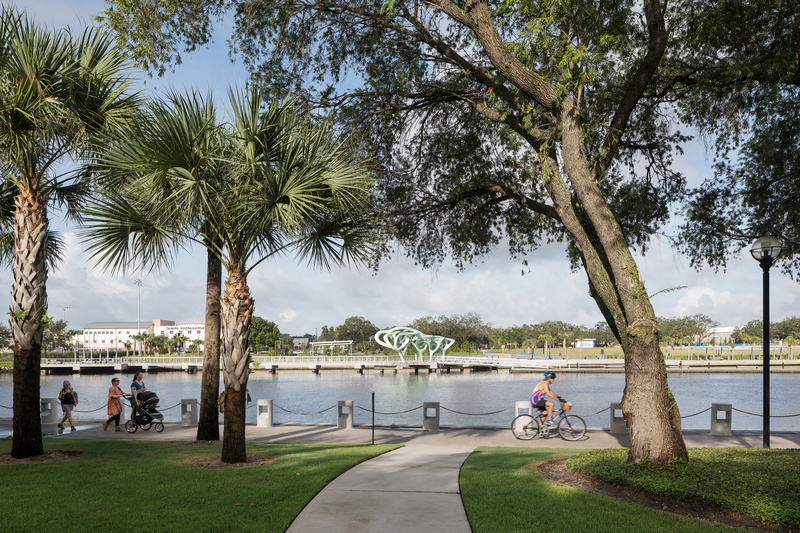 While Form of Wander is a contemporary twist on this idea, it’s a destination for Floridians in its own right.